Safranbolu's quiet, picturesque setting is lined with timber-framed Ottoman houses and mosques set among green fields and hills. Plus one can visit other Ottoman towns in the area. One of the most-see villages is Yörük, which will be described in a later post. Kaleiçi district of Antalya – the old city is nicely restored but overrun with tourists and surrounded by thick city traffic. As we explained in our Turkey - Getting Started advice on travel pace, for a car trip it is preferable to plan for about 3 driving hours between each hotel stay, which allows sightseeing stops on the way. If you are coming from Istanbul it will take at least 4.5 hours – depending on traffic in Istanbul – to drive to Safranbolu, 414 km away. Our drive from Göreme to Safranbolu was one of the longest segments of our 31-day trip – 512 km. According to Google this should take about 6 hours driving time. In fact, we left at 09:00 h and arrived at 15:30 h. It was also the most boring scenery so we did not stop to admire views or take photos. About the only thing that happened was at a rest area. We noticed a family, especially women dressed in black burqa (completely covered face). We thought they were Syrian refugees. Two of their young children came over to our car begging for money and would not go away. They did not look poor. The family of eight had just parked their over-sized mini-van and ordered a large lunch from the restaurant. They sat outside on the grass to eat. ﻿We had debated for a while whether to stay in one of the Ottoman pensions in the old city. If you don't have a car that would be your best option. 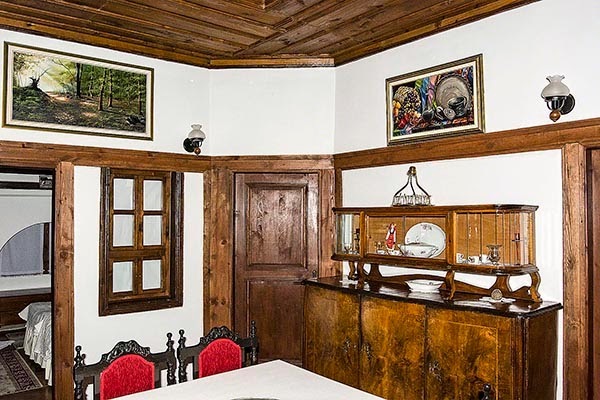 But the raves for Raşitler Bağ Evi pension on Trip Advisor convinced us, even though it is on the northern outskirts of this small town. So it was late afternoon by the time we got to the town. We managed to turn left onto Sadri Artung Caddesi, a major boulevard to the Bağlar (Turkish for “orchards”) district. But then our "saved" Google map disappeared on us. Add to that, the lack of road signs and – we were lost! p.s. : finding our way back over the next two days was easy. So we stopped at a grocery store and asked for directions. 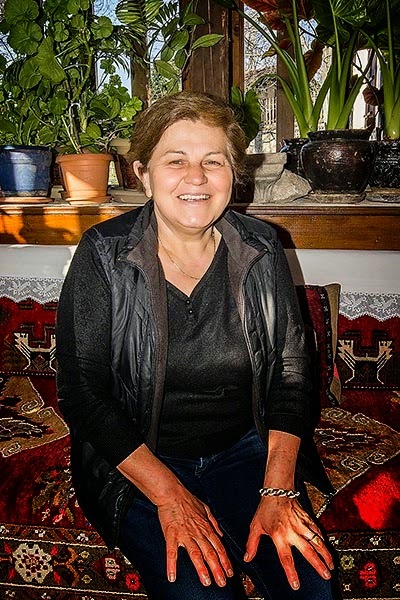 We did not think they knew our small pension, so we asked for nearby Değirmenbaşi Mosque. A customer who spoke a little English heard our request and offered to go with us to ensure we found it. We told him we were actually looking for Raşitler Bağ Evi and he said he knew the Colonel (the owner)! What a small world!!! 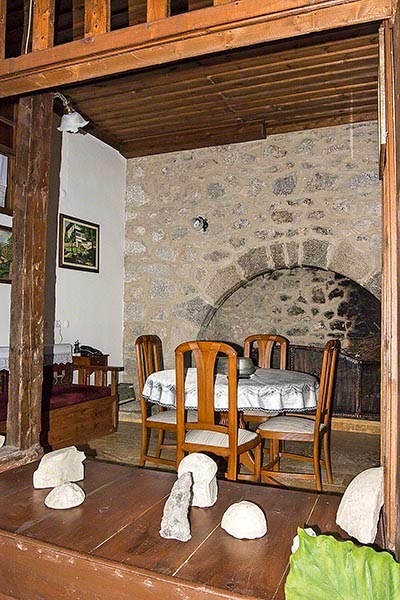 Bağ Evi means country house, since this used to be an orchard outside of town in the old days. Our first view is captivated by lovely hand-cut stone walls. 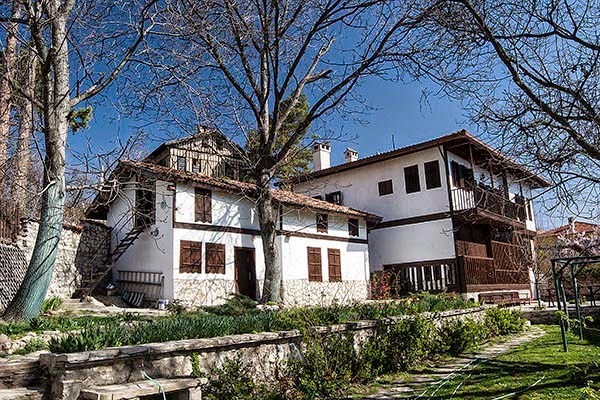 This 280-year old Ottoman house has been in Umran’s family for nine generations. The minute we arrived we sensed warmth and friendliness. We felt like we were friends in their home rather than guests of a B&B. We spent a lot of time talking with them. 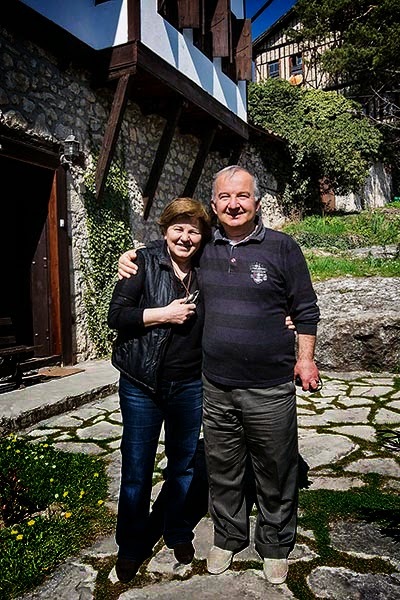 Umran is a retired high school teacher and Erhan is a retired Air Force colonel. They are very sincere people. A few years ago they restored this old family home – and what a place it is! As in Ottoman times, we had to remove our shoes to walk inside on the old wood floors. 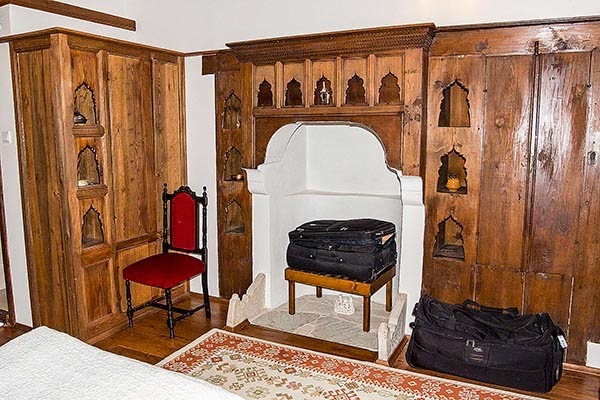 The four guest rooms are on the second floor, which has its own parlour and even a traditional reading nook. What a magnificent bedroom with rich dark wood floor and ceiling. We loved the wood niches in the antique "wall system" and the colourful carpets. What a difference a day makes. 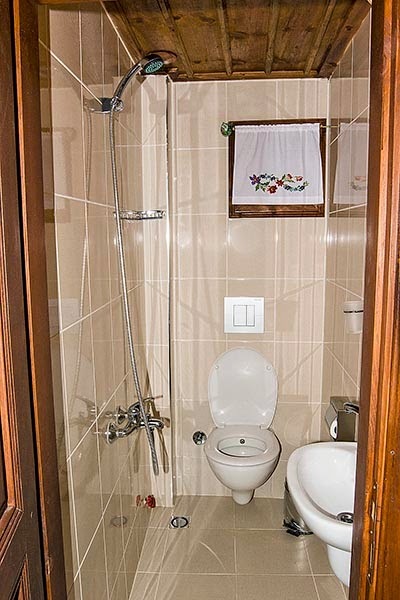 Yesterday, the Göreme bathroom was as large as a small pension. Today’s bathroom is closet size and the shower goes right onto the bathroom floor. Maybe that’s the origin of the British word “water closet” meaning bathroom. 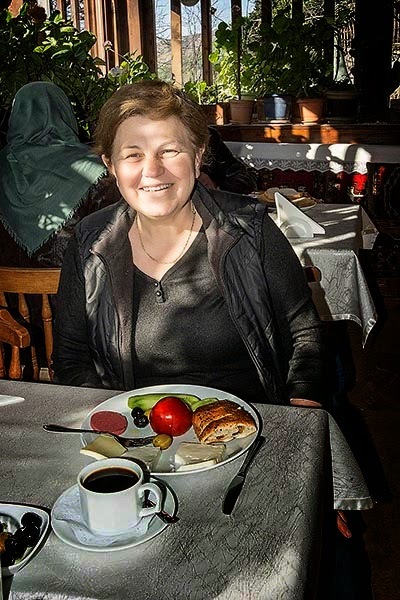 The breakfast the next morning was marvellous – omelet, cheese, olives, homemade fruit jams, bread and coffee. The setting was equally superb. 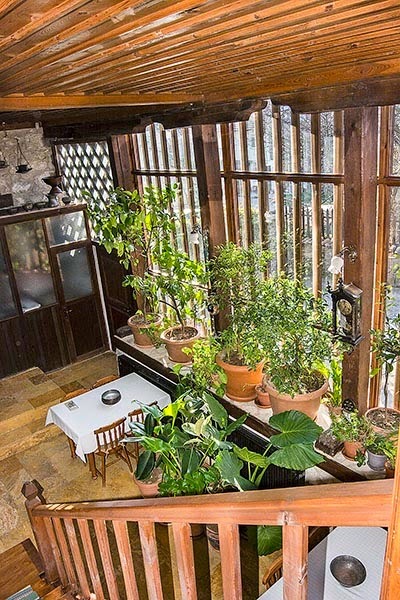 The ground floor dining room has a wall of glass lined with glorious green plants. This contrasts with the red upholstered divan and the dark wood ceiling. Off the dining room is the open wall living room with its stone-arched fireplace. The garden outside is a remnant of the former orchard, full of trees and even views of the surrounding hills. 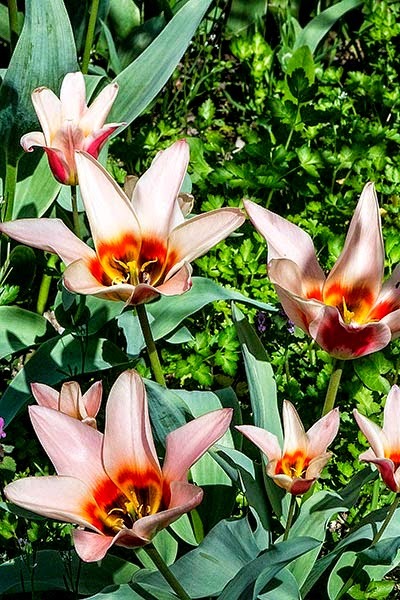 There was a bed of magnificent tulips. 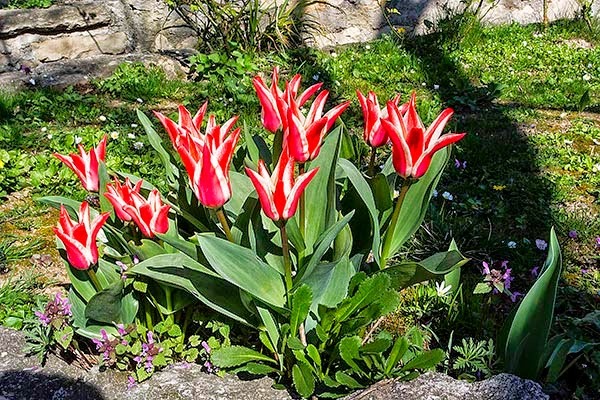 Spoiler alert: the Dutch did not discover the tulip; the Turks introduced the tulip to Europe. 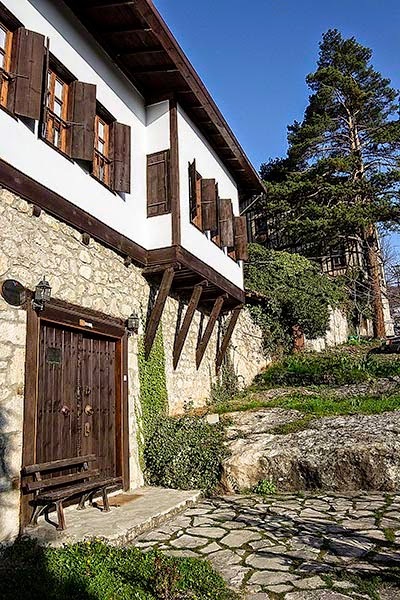 In short, you not only get a nice place to stay, you get a feel for a typical Ottoman house that can compete with any museum. Plus you can learn about Turkish life and culture by talking with the Hangun family. This was one of our favourite places to stay in our whole trip in Turkey. 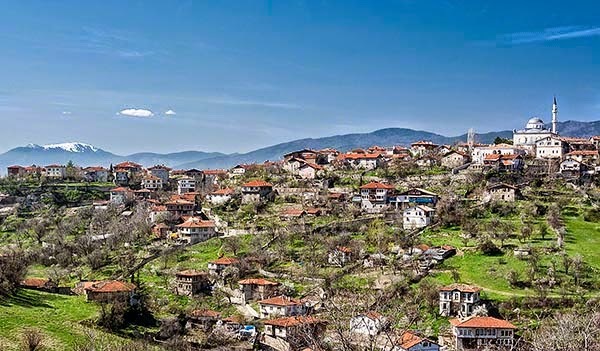 So is Safranbolu a must-see? 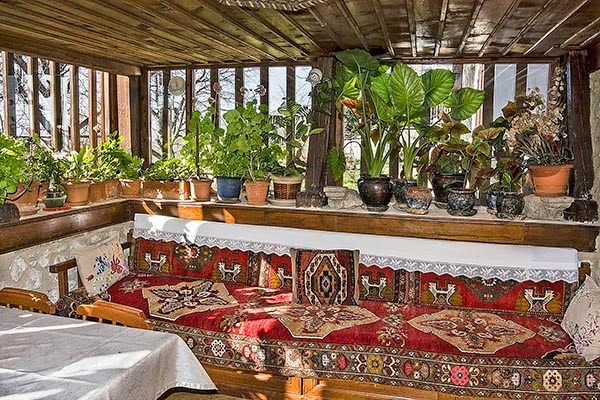 It is worth going just to stay at Raşitler Bağ Evi.